Tired of the same old boring look HTPC cases? Don’t worry, so is Sunbeam. That’s why their new Acrylic Case is really going to turn some heads. And they would never think of sacrificing performance for style, as this case uses only the highest quality components available. The internal capacity is large enough for eight 3.5” bays and the external has room for two 5.25” drives. Cooling is a breeze as well, by way of 4 quiet 80mm fans. For optimum cooling, Sunbeam has placed two in the front, one in the rear and one inside the case. 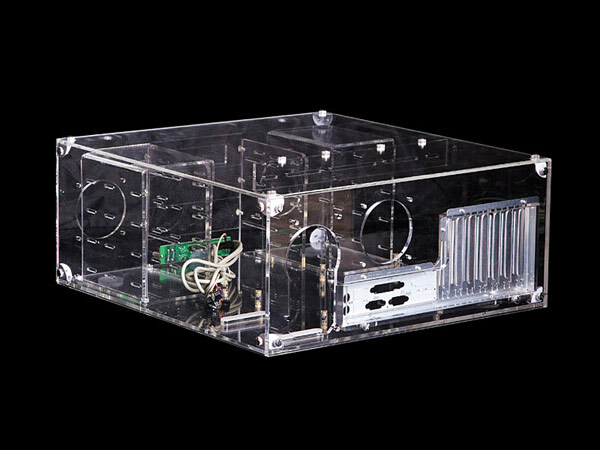 So if you are looking for superior, see through styling and premium performance, look no further than the Sunbeam HTPC Acrylic Case. Material: Acrylic Dimensions: 21.5" x 19.5" x 3.5"
Side Panel: Transparent Drive Bays: 2 x External 5.25" / 8 x Internal 3.5"
4 x Blue 80mm LED fans included!